Center for Visual Music (CVM) is an archive and library devoted to Visual Music, experimental animation, and abstract media. Our collections include papers, films and artwork by Oskar Fischinger; the original research collection of animation historian Dr. William Moritz, and collections covering the history of Visual Music: artists, exhibitions, theories, color organs, vintage instruments, Expanded Cinema, performances, historic events, 1960s psychedelic light shows and more. It’s the world’s largest collection of visual music resources. documentation of performances and demonstrations of visual music instruments (in April, Oskar Fischinger’s Lumigraph). Oskar Fischinger, Mary Ellen Bute, Jordan Belson, Jules Engel, Charles Dockum, John and James Whitney, Hy Hirsh (photography collection), and Ed Emshwiller are just a few of the historical artists in the archive. We often receive inquiries to visit CVM to view the collections, but we don’t have a physical gallery or exhibition space (yet....). Now we can share with you treasures from the library and archive. We're also excited to share rare videotape interviews, recordings and presentations covering the histories of Visual Music, most not available elsewhere. Please Note: Despite Patreon’s promotional claim, we just launched and don’t have over 60 posts yet! Images and videos are for our patrons here, please do not share publicly. Contact us for permission to reproduce in your publication. CVM is a 501(c)3 nonprofit organization currently based in Los Angeles. Funds raised through Patreon will help support our preservation, conservation, and exhibition programs. Film preservation is a core part of our mission. It can cost from $3000 to $20,000 to restore and digitize a short visual music film. Sadly, not all of the films from visual music's history will survive for future generations. Funds raised here will help save more. Thanks for your support! CVM also seeks sponsors for our salons. CVM salons are open to the public, featuring historic and new visual music films, plus guest artists and sometimes performances. Please contact us if you're interesting in sponsoring a salon, especially in Berkeley, Boston or London. Cover image: Raumlichtkunst (1926/2012) by Oskar Fischinger, HD reconstruction by Center for Visual Music. Installation view at Len Lye Center, NZ. Image © 2017 Center for Visual Music. Image in About section: Still from Mary Ellen Bute's film Mood Contrasts, 1953. © Center for Visual Music, 2019. We reserve the right to block disrespectful patrons. We are grateful for your support of CVM’s work, and we'll give you a shout out on social media. Thank you! 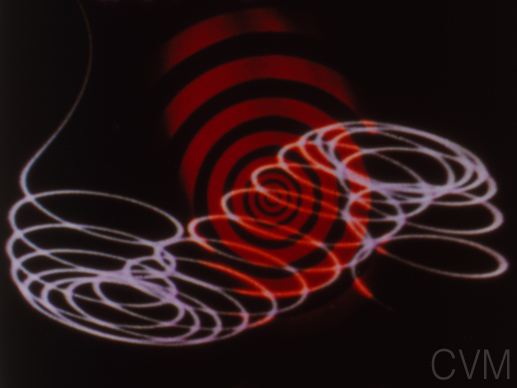 Image: still from Oskar Fischinger, Kreise, 1933-34. View historical artwork, graphics, posters, animation diagrams, flyers, photographs, film stills and other materials from our Visual Music archive and library. New images are added monthly. It’s a curated journey through the rich history of Visual Music. And you’re supporting our work preserving it, thank you! Image: sticker sent by artistBruce Conner to animation historian William Moritz. Access to audio-visual materials from the library and archive - interviews, lectures, presentations, demos and talksabout Visual Music, by historians, artists and others. One new video or audio recording is added each month, to stream. Plus documents and other relevant resources, and access to the $4 tier. Image: Barbara Fischinger, daughter of Oskar, demonstrates his Lumigraph. For those who are able to support the archive and library and its continued conservation, and want to show their support and appreciation at a higher level. Benefits are same as the 10 and 4 level, plus name recognition in our newsletter and social media. You'll help preserve the history of Visual Music. Image from Jordan Belson, Mandala, preserved by CVM. Thank you! Special Access: request specific material from the archive - research, documents, photographs. If we have it, we'll post it with related material. You'll also see research materials requested by other scholars. Plus occasional Premium Content, selected rare films and videos to stream. Includes the benefits of the $10 and $4 levels, and a complimentary ticket to CVM screenings or salons in your area. Please note: Content may contain copyrighted material and is for your research purposes only. On occasion some material may be restricted. One request per month, please. Image: Fischinger exhibition at San Francisco Museum of Art, 1953. For those interested in helping support the conservation and restoration of the archive's holdings. You'll receive name recognition on our website and social media. After you've been a Patron for 5 months, you'll receive invitations to private events organized by CVM, usually several times a year in various cities. Plus benefits of other levels. And our undying gratitude for your help supporting our work, the archive and the history of Visual Music. This tier is a one-time contribution, not monthly. Sponsor the digitization of a visual music film, from 16mm or 35mm film to digital. When the digital version is exhibited publicly, you'll be credited on our website, social media, program notes, and also thanked in the next CVM newsletter. Plus you’ll receive a private link to view the film online. If possible, we’ll post the film or at least an excerpt here on Patreon (depending on rights & permissions). CVM is a 501(c)3 nonprofit organization. Image: Charles Dockum, Mobilcolor Performance Film.